Cosplaying teen Edan Kupferman has an easier time expressing her anger at chaotic and troubling circumstances in her life when wearing the mask of super-powered Gargantua. An insightful look into what so many of us love about comics – and some of the challenges we have to face in the field. When Edan Kupferman dresses up like her favorite character, Gargantua, she feels tall and powerful. 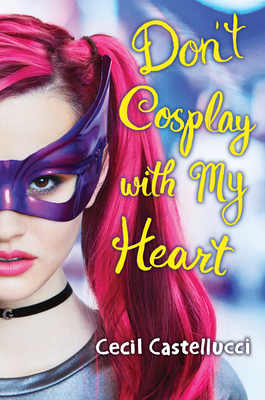 That's important right now, because her family is a mess, her best friend is gone for the summer, her crush is confusing, and Edan's feeling small and not sure which end is up.When Edan's cosplaying, she can be angry, loud, and not the good girl everyone thinks she is. And when she's at conventions, she feels like she's found her own Team Tomorrow. But when her personal life starts to spiral out of control, Edan has to figure out whether she needs a sidekick, or if she has the strength to be the hero of her own story. Cecil Castellucci grew up in New York City and is the author of such young adult novels as Rose Sees Red, Boy Proof, and The Year of the Beast, as well as the comic books The Plain Janes, Janes in Love, and Shade: The Changing Girl. Currently, Cecil Castellucci lives in Los Angeles. You can learn more about her at misscecil.com.